Property Owners: List your Poitou-Charentes property on the premier site specialising in French holiday lets. More Info. Gite holidays are a favourite of many a tourist in France, and gites in Poitou-Charentes are no exception. Ideal for the visitor who wants live life like the French, they take a lot of beating. However, they’re not the only possibility, as the range of comfortable Poitou-Charentes villas are much sought after by the discerning holidaymaker who wants to not only be able to come and go as he or she pleases, but also experience the warmth and welcome that the region offers. With its excellent climate and coastline, Poitou-Charentes is an ideal destination for those in search of a beach. 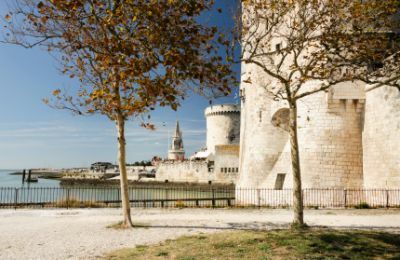 La Rochelle, Royan and Rochefort are all popular havens for the sun-worshipping classes, although you do have to compete with the large areas of coast given over to the oyster beds. However, a nosey around the salt-water marshes and the oyster ports does make a pleasant change from the usual beach-type activities. Still on a coastal theme, Marais Poitevin, a large area of marshland, also known as Venise Verte (Green Venice) is a marvellous place to spend a couple of days. Two thirds of the area is dry marsh, which is used for farming and breeding, while the remaining third consists of a network of slow-moving rivers and other water channels, woods and fields. Boating is popular, as are rambling, riding and fishing, while there are also a number of marked cycle tracks. Tranquillity and beauty abound. A visit to the town of Cognac and a tour around one of the great houses that produce the drink is something that no tippler will want to miss. Learn all about the processing and history of this local nectar, and try a glass at the end. You can also buy, so there’s an opportunity to acquire a bottle of something that’s not readily available back home. A holiday spent in Poitou-Charentes is an opportunity to get lost in some seriously high-quality food and drink. Apart from Cognac, the region also produces Pineau des Charentes, a very pleasant aperitif, and you can choose either white or red. As for local wines, you may be surprised to learn that there’s a wide choice, so take the opportunity to try something that you’re probably not familiar with. You won’t regret it. Seafood is very popular, and the oysters from Marennes-Oléron are reputed to be some of the finest in the world. Bowls full of mussels are seemingly everywhere, while other locally caught fish are prominent on all menus. Poitou-Charentes has a reputation for its goats’ cheeses, so if that’s a favourite of yours, you’re in for a treat. Restaurants, markets and shops will often slice a portion from the larger cheese, which is shaped like a log. Two to look out for are Chabichou du Poitou and Mothais sur Feuille. The region is also home to the outstanding Echiré butter. It may be expensive, but once you’ve tasted it, you’ll understand why. The flavour is out of this world, and that’s the reason it’s served in all the best restaurants.